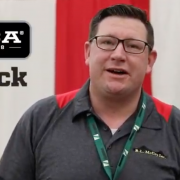 At the Midwest Construction Expo in Indiana this February, R.L McCoy produced a demonstration video highlighting the benefits of DICA’s engineered ProStack® plastic cribbing blocks. “Once I found out about it, I had to have a set. Our operators are already crazy about it,” Dan McCoy PE explains in the opening moments of the video. McCoy demonstrated the ease of creating a safe cribbing setup by stacking ProStack plastic cribbing blocks onto a SafetyTech® Base Pad, then cross layering additional blocks. He underscored how the ProStack design is an ideal setup when additional height is needed and the outrigger loads do not exceed 110,00 pounds. Sign up to receive exciting new product information, industry updates & more! DICA is a family-owned and operated company that specializes in building high performance engineered outrigger pads, crane pads, and cribbing blocks that are lightweight, easy to use, and long-lasting. DICA products are proudly Made in the USA, ASME B30.5 compliant and used by operators in 40+ countries around the world. © 1988-2019 DICA Outrigger Pads. All Rights Reserved.